I WOULD LIKE TO SAY THAT WHAT MADE RIC FLAIR'S BOOK YOU SEE ABOVE GO TO NUMBER 5 ON THE NEW YORK TIMES BESTSELLER LIST WAS THE FACT THAT UNLIKE HULK HOGAN'S BOOK WERE HOGAN TRASHES EVERYBODY AND ALWAYS WANTS TO TAKE ALL THE CREDIT FOR EVERYTHING HE HAS ACCOMPLISHED, MR. FLAIR IS THE OPPOSITE IN THAT HE CREDITS ALL THE PEOPLE WHO ALONG THE WAY HELPED MAKE HIM THE GREATEST PROFESSIONAL WRESTLER TO EVER LACE UP A PAIR OF BOOTS. YOU CAN TELL MR. FLAIR'S SINCERITY THROUGHOUT THE BOOK. THAT IS THE DIFFERENCE BETWEEN MR. FLAIR'S BOOK AND HULK HOGAN'S BOOK. HOGAN WAS CAUGHT LIE AFTER LIE AND EXAGERATION AFTER EXAGERATION IN HIS BOOK BY WRESTLING EXPERTS, BUT MR. FLAIR WAS VERY OPEN AND CANDID ABOUT EVERYTHING INCLUDING WHEN HE KNOWS HE DONE WRONG IN HIS PERSONAL LIFE. THAT IS WHY HULK HOGAN WILL GO DOWN IN HISTORY BY NOT BEING RESPECTED BY ALL OF HIS PEERS AND WHILE RIC FLAIR IS THE MOST RESPECTED PERSON IN THE HISTORY OF THE BUSINESS. 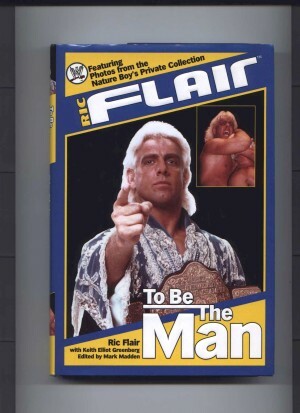 IF YOU WANT HONESTY AND ROAD STORIES AND WHAT IT IS LIKE TO BE THE GREATEST PROFESSIONAL WRESTLER OF ALL TIME THEN GO BUY RIC FLAIR: TO BE THE MAN, IT IS IN A BOOKSTORE NEAR YOU.